This is an artifact of the New Orleans tourism industry. A free map of unknown origin found on the sidewalk with several areas highlighted, then streets highlighted providing routes to the desirable, interesting parts of the City. Old maps provide much information about what was known in times past, as well as the philosophy and cultural basis of the map, which were often much different from modern cartography. Maps are one means by which scientists distribute their ideas and pass them on to future generations (Merriam 1996). This is then an example of how the user of the map (the tourist) adjusted his map to cross out places he was not to go circle the places he was to go and highlight the roads he was going to take to get there. Reminiscent of ancient maps where the cartographer added monsters to unexplored corners to warn explores of unknown dangers; there be monsters in the 9th ward. This begs the question of what was this unknown visitor’s relationship to our city and his perceived attitude of the crossed out areas? This makes me think about my personal relationship to the city. I live in a crossed out area and often travel by bicycle through crossed out areas, areas according to this crime map, are dangerous. Furthermore my chances of becoming a victim of crime are 1 out of 132 and similar map shows that my chances of becoming a victim in my hometown of Chicago are 1 out of 94. Upon closer examination of these maps you might notice that New Orleans is almost a checkerboard with high crime areas bumping up to lower crime areas, where in Chicago, most of the high crime areas are segregated to the south and west sides. 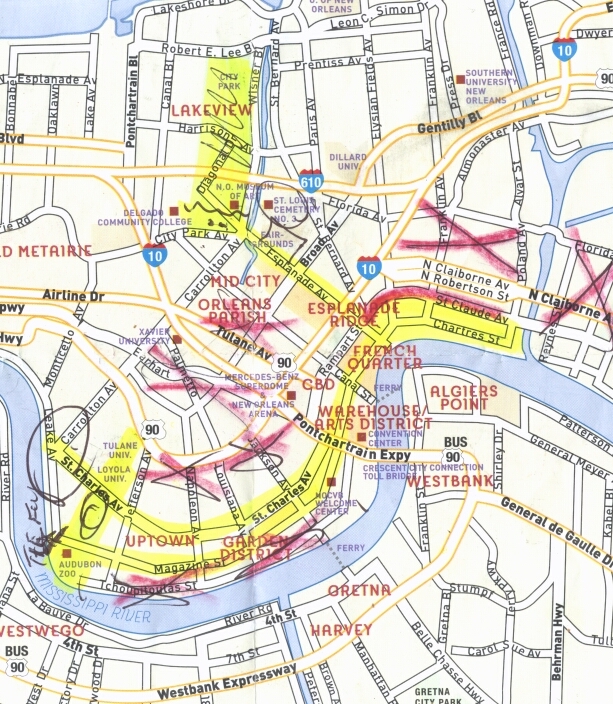 Its also important to note that one’s relationship to the city and to the map of the city changes and over time being able to synthesis the curve on St. Charles as the city follows the bend of the river is something that can happen only after you have lived in this city for long enough. This leaves us to ask many questions about the safety of our city. Obviously visitors and residents always need to exercise caution and there are many parts of the city that offer very little to visitors whose time is already limited. But crossing out vast parts of our city seems in to be in effect saying people in these areas don’t matter, they are without history.